Have you made the pledge to buy local? Join Fash Flood in pledging to support some of Omaha’s most unique, award-winning boutiques and vendors this holiday season. 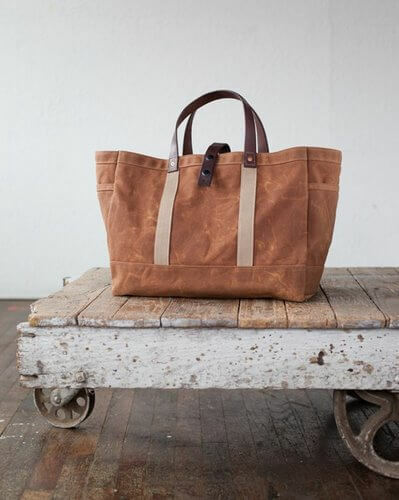 Topping my list of most coveted items this holiday season is a one of a kind bag from Artifact Bag Co. The No. 175 Tool/Garden Tote ($155) or the No. 105 Utility Tote ($125) are the ideal gifts for most anyone in your life, from the book hauling college student to the environmentally-conscious grocery shopping mom. The designer behind the line is Chris Hughes, named one of the Midlands Business Journal’s “40 Under 40” and winner of the “Young Entrepreneur of the Year” award for 2011. Each bag is crafted using a combination of hand tools and vintage industrial equipment and carries a lifetime guarantee. Shop the Artifact Bag Co. locally at Denim Saloon, located at 4914 Underwood Avenue in Dundee or online at shop.artifactbags.com. Another unique gift option for the fashion-forward lady in your life is a subscription to Princess Lasertron’s “Make it Pretty Subscription Club“. Megan Hunt, the designer behind Princess Lasertron is a local bridal designer specializing in felt floral bouquets and special occasion dresses. Hunt was also named one of the Midlands Business Journal’s “40 Under 40” for 2012. Choose to send a two, six or twelve month subscription to the club and the recipient will receive a surprise in the mail every eight weeks for the duration. From shoe clips made with vintage earrings to a small handmade fabric-covered notebook, this truly is the gift that keeps on giving long past the end of the year. The cost of a subscription is $30 for every two months, which can be purchased at shop.princesslasertron.com. Fash Flood congratulates another recent award winner, local boutique Scout: Dry Goods & Trade for winning KETV’s “Small Business of the Year” award for 2012. Scout is celebrating their win with a fabulous special benefiting both gift-givers and recipients. For every $25 in gift cards purchased, receive a $5 gift cards for free. In addition to this special, every December purchase will receive a coupon valid in January for 30% off any purchase of $50 or more. Scout is located at 5019 Underwood Avenue in Dundee. Visit ilovescout.com for more information.